You have to try Roasted Peppers Sautéed with Garlic in Olive Oil! 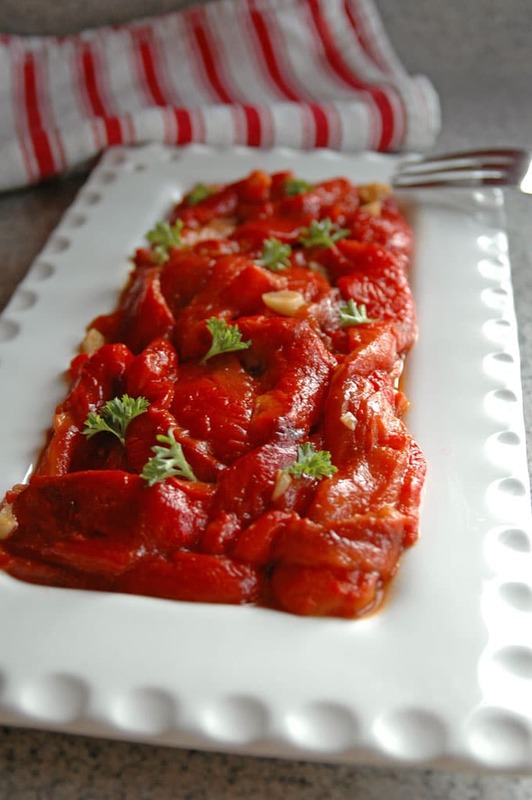 An Italian family favorite that’s vegan, gluten free and simply the best roasted red peppers you’ll ever have! 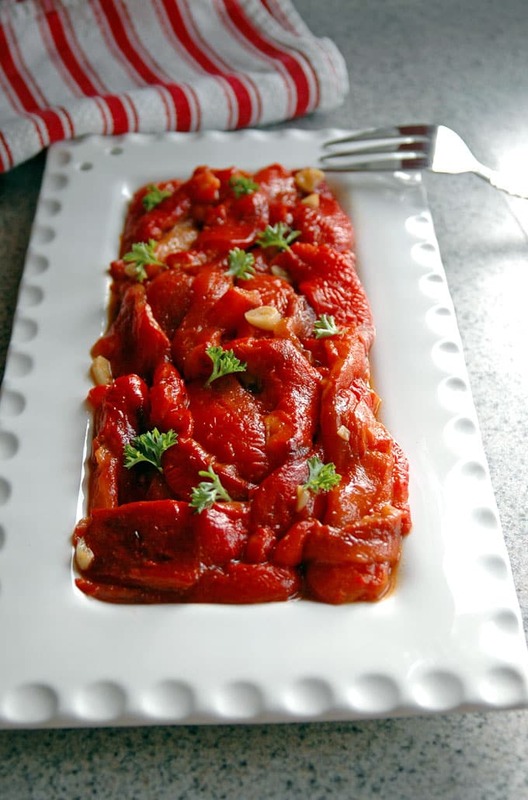 I need to introduce you to one of my top favorite vegetable dishes, one that I’d be content to eat as the main meal — with a side of fresh, crusty bread, of course. Roasted peppers sautéed with garlic in olive oil are so divine, I’m pretty sure angels serve them on platters just inside the gates of heaven. The aroma alone is enough to make me swoon. Then, the peeled peppers are sautéed briefly with garlic in olive oil. So, so good! If I close my eyes, I can still see Nonna wearing her blouse, slacks and gold, open-toed, Daniel Green slippers (with heels), charring the peppers over open flames on the basement stove. Her sleeves would be rolled up and her fingertips blackened, yet she’d be smiling with contentment, unfazed by the messy process. I just loved keeping her company. Nonna always made enough for leftovers, so sometimes, I’d have a roasted pepper sandwich for lunch at school. Let me tell you, nothing screams “I’m the child of an immigrant” louder than greasy olive oil stains on your brown bag. As the other kids were eating their bologna on Wonder bread, I could feel my face burning with embarrassment as I’d quickly remove my pepper-stuffed, 5-inch slab of Italian bread. But one bite later, I couldn’t care less if I had olive oil dripping down my chin. Because this…this….was far, far better than any bologna sandwich. Vegan, gluten-free, and the most flavorful peppers you'll ever have. Great with bread for dipping or tucked into a crusty sandwich. Set the top oven rack as high as it will go. Place the bottom rack in the middle position. Preheat the broiler. Rinse peppers and pat dry. 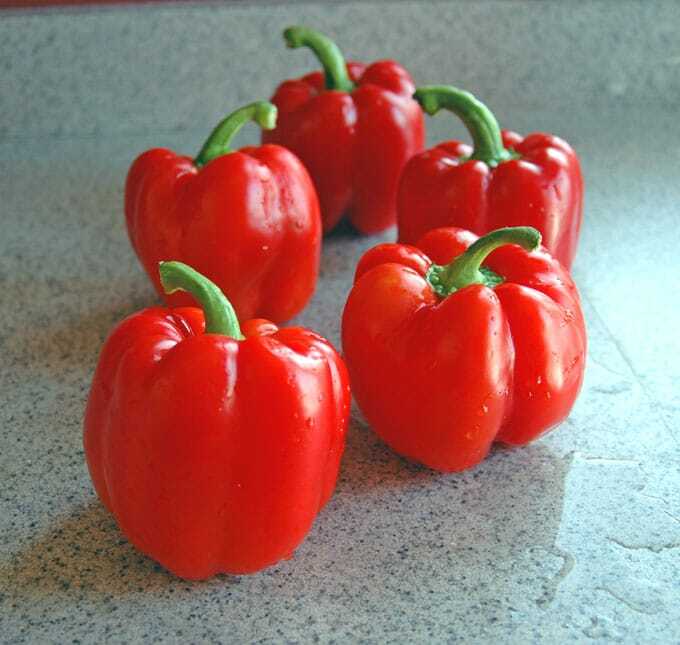 For each pepper, use a knife to cut a circle around the stem to remove and discard it. Cut the pepper in half the long way (from top to bottom) and remove the membranes and seeds, discarding them. 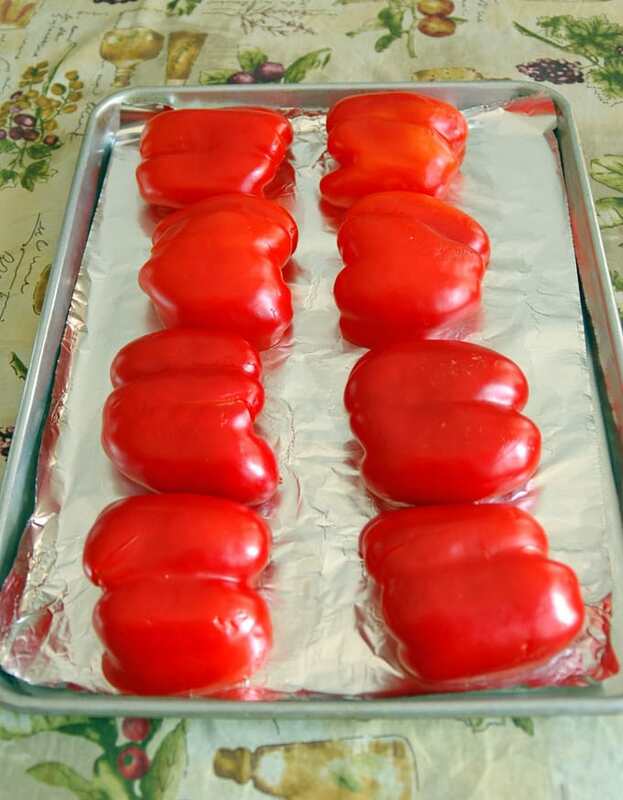 Line up the pepper halves on two, foil-lined sheet pans with sides, flattening the peppers a bit with your hands. Broil the peppers for 12 minutes, or until they are blackened. The peppers on the lower rack will take longer than the top ones. 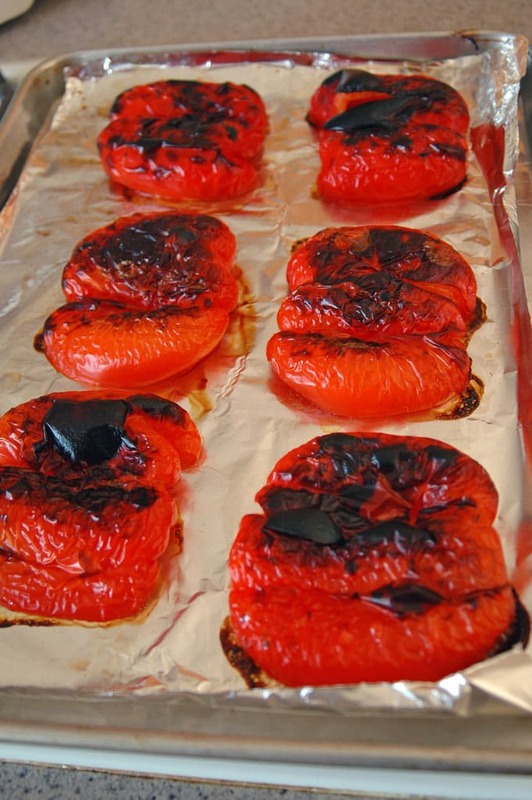 Place the blackened peppers inside a clean, brown paper bag and fold the top closed. (A plastic Ziploc bag will create extra steam and cook the peppers more, but it's OK to use if you don't have a brown bag.) Keep the peppers in the bag for 15 minutes to enable the skin to be removed easily. While the peppers are steaming in the bag, peel and slice your garlic. After 15 minutes, peel the peppers with your fingers, placing the peeled peppers in a drainer in the sink. Blot the peppers with paper towels and cut them into strips about 2 inches wide. Heat the olive oil in a 12-inch skillet over medium-high heat. Add the garlic slices and cook them for a couple minutes before adding the peppers to the pan. Gently toss the peppers to mix with the oil and garlic. Add salt and pepper, and sautée the peppers for 8-10 minutes, stirring occasionally, until the garlic is done to your liking. Garnish with parsley. Serve the peppers at room temperature with crusty bread. Store leftovers in the refrigerator for up to five days. This sounds delicious! Is it possible to make the first part (up to the brown bag) in advanced? Like the night before? Thanks, can’t wait to make this recipe! Hi Ileana – Yes, you can do the first part ahead of time. I’d peel the peppers after roasting them, then store them in the fridge. I have been looking for this recipe forever my mom passed away and I only made them once with her but vaguely remembered what was needed thanks so much!! My Nonna made this dish except added black olives as well. One of my all time favorite side dishes. Can’t wait to make this again. Andi, aren’t Nonnas the best? I bet the black olives looked beautiful with the peppers. Thanks for your comment, and I hope you enjoy this! These look amazing! I’m always so happy to see traditional mediterranean dishes on food blogs. My spanish grandma used to make a similar side dish. We add thinly sliced raw onions in the end and eat the peppers with fried fish and bread. I definitely have to try your version though, because the garlic and olive oil sounds like a great idea. These look great! We make a similar dish all the time, eating it as a side dish or as an antipasto atop bread. Your photographs really bring this one to life. This is my first visit to your lovely site, but it certainly will not be my last! Complimenti! Grazie, Adri! I’m so happy you visited and look forward to diving into your site! I cannot even tell you how much I love this post as it is one more proof of our soul sisterhood and evidence of being raised in a family of Italian immigrants. The first time we took my “Mema” to Disney…we brought our own green pepper sandwiches which, as you know, left beautiful greasy olive oil stains on the very large brown paper grocery bag we used to carry all around Disney until it was lunch time. Thank you so much for bringing me back to that cherished memory. 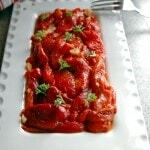 And, yes, Greek Wedding, is an all-time favorite in our house…as are roasted red peppers as you’ve shared here. My my my! 10 stars!! Yes, I have been looking for a recipe like this! Thanks so much for sharing it. You’re welcome, Tammy. I hope you enjoy it!